This book shows how scientific and psychotherapeutic practices change into worthless rituals called by the famous physicist, Richard Feynman, "cargo cult." It is a must-read for everybody who is interested in psychology, who is studying or intends to study it, but also for present and potential clients of psychotherapists and parents of mentally-disabled children. Readers will learn which parts of psychology and therapy are cargo-cult-like and which are reliable. This book is the second part of trilogy devoted to the dark side of psychology. The first volume was published under the title Psychology Gone Wrong: The Dark Sides of Science and Therapy, also released by BrownWalker Press. Psychologist Witkowski follows up his 2015 book Psychology Gone Wrong (with M. Zatonski) with this second art of what he says will be a trilogy devoted to the dark side of psychology. It examines the many problems that plague modern psychological research and psychotherapeutic practice. He critiques problems in statistical significance, over-generalization of findings from neuroscience, and uncontrolled experiments on humans, and he picks apart a number of questionable practices in the treatment of children, including the pseudoscience of educational kinesiology, attachment therapy, trauma debriefing, Facilitated Communication, Dolphin Therapy, and so on. In his Foreword Alcock calls this "a very important and valuable book" and praises the author for not just his critical examinations of shortcomings in psychology but for his support of the value of evidence-based psychology. Sadly, too much popularizing about psychology is filled with misrepresentations and myths. Not willing to sit silently and allow this to happen, Tomasz Witkowski, in this fine book, Psychology Led Astray: Cargo Cult in Science and Practice courageously confronts the problem head on. Scientists, mental health professionals, students, and laypeople who care about separating the pseudoscience from the science need to read this book. Witkowski has written a new book that is certain to ruffle a lot of feathers. He uncovers cargo cult practices in psychology, unmasking therapies that are devoid of science, dangerous, and even cruel, especially those directed at children. Even if you don't agree with calling these travesties of science cargo cults, it will make you wonder which other generally-accepted psychological principles and therapies are based on good science. This is a well-written book, and the extensive documentation that is provided makes it an excellent source of reference material as well. Every psychologist, every psychology student, and every layperson with an interest in psychology or with need for its services will benefit immensely from reading it. 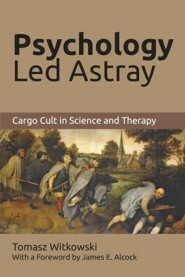 And although it is largely devoted to decrying the egregious departures from scientific rigour that afflict much of our discipline and to skewering the many false and exploitative therapies and techniques that are huckstered to a hungry public, it is ultimately a book that honours and defends science-based psychology. I highly recommend it. James Alcock, Professor of Psychology, York University and the author of Parapsychology: Science or Magic? This book -that author describes as a popular science - is in fact a guide on how toprotect against charlatans. Every doctor - especially those working close withpsychotherapists - should carefully read the contents of these volumes. The book every student in psychology, and more widely every person interested in psychology should read - and let's add everyone else, the public at large, politicians, or health professionals. Must take a look urgently! Dr. Tomasz Witkowski is a psychologist and science writer. He is the founder of the Polish Skeptics Club and specializes in debunking pseudoscience, particularly in the field of psychology, psychotherapy, and diagnosis. He is the co-author of Psychology Gone Wrong. The Dark Sides of Science and Therapy and many other books. He published dozens of scientific papers and over 100 popular articles (some of them are published in Skeptical Inquirer). As an expert in science-pseudoscience issues, he is frequently called by the media to comment on frauds and abuses witnessed in psychology, psychotherapy and other areas of scientific activity. In 2010, he was awarded as a Rationalist of the Year in Poland.